Which colors do you think are the best? We need two replacements for white and black. EDIT: Should I try some other colors? Why do you need more colours? I would consider gameplay where used more colours as red, blue, green and yellow as completely confusing. The ZED Online is aimed for battles of 10 different teams in one huge online battle? From your picture the pink is the most distinguishable, but I wouln't like to command pink heavy tank. The Zod engine support up to 8 players and I want to keep it that way. KISSMAD rightfully pointed out that the white and black players are hard to see, hence I am looking for a replacement for black&white. That's all. I will have an option so you can change the color locally. I.e. you can always change your color to red (or whatever you prefer), but the other players would still see you as pink. I would like to clarify, ZED Online is definitively not aimed for to have one giant battlefield. The aim is for lovers of the game to easily connect online with their friends and play one or two rounds of simple 2, 3, 4 player maps. I eventually want this to be as accessible a possible. This means no registration, no port forwarding (I will work on uPnP support), no entering of IP addresses/ports, just pure gameplay. EDIT: I would like to add that although the name is "ZED Online" I will also focus on single player and local network play. I in fact spent the last few days working on network discovery via LAN / WLAN and even Bluetooth, so that players hopefully don't have to enter IP addresses and can "just play". How does a bright orange look? There is always cyan or lime. Really bright Orange might look to similar to Yellow. I tested bright brown or "chocolate". Cyan is I think to close to Teal which the Zod Engine already provides. Isn't Lime just the same as Green?? OK, I am bit more familiar with ZOD Engine now and I see there are 8 colours and 8 teams avaliable. But common gameplay for 2-4 players. On this ground I would accept also pink colour in 8 teams game. It wouldn't be issue for me and worth of effort to make optional or local colours. Cyan is a bright blue. You have made it look like teal with 35% Cyan. I beg to differ that Orange is the same as Yellow. Can you try these without adjusting the colours? I'm not a colour expert either. I don't want to offend somebody - I want just reach answers for few questions. How is it possible this forum survived till 2019?? Why Z_Expansion and Z_open source parts seems to be alive and Z Steel Soldiers seems dead?? There was 2014 remake of it and it is also on Steam. (Despite I have never installed STEAM). I bought pre2014 version of Z Steels Soldiers and played it and I liked it. Maybe not as much as DOS_Z, but I liked it and played for hours. The problem is that a team color doesn't consist of one color but has 16 colors (different nuances). So what I tried to do is to take the base colors in grayscale and interpolate between that and another color. 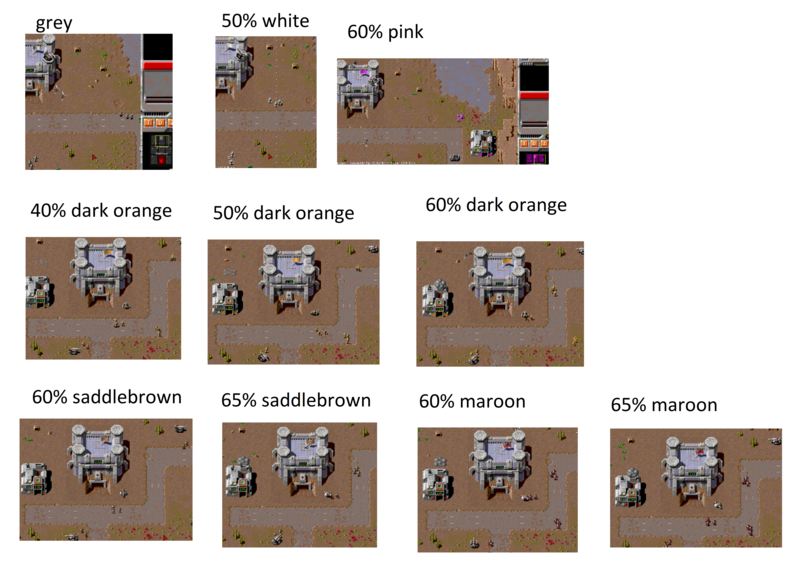 That why I can't take 100%, because then all 16 colors would be the same exact colour and that just looks awful. where c is the new color I interpolate with (for example pink) and alpha is between 0 and 1 controlling how much of the original colour will be visible. Not that best approach, but much easier for me than fine-tuning all 16 colours. I agree it's quite a miracle. When I posted here I expected it would take months for someone to reply (which was the reason I published ZED Online so early when it is still full of bugs). I think Z Steel Soldiers was never that popular. I never played it, so I can't comment on how good the game is. I bought the 2014 Steam and Android version as part for my ZED Online project. I my opinion it's a broken mess. It's a lazy port of the original game with a new UI, which has it's merits on mobile, but on PC it's inferior to the DOS version. Z Steel Soldiers is completely different gameplay. 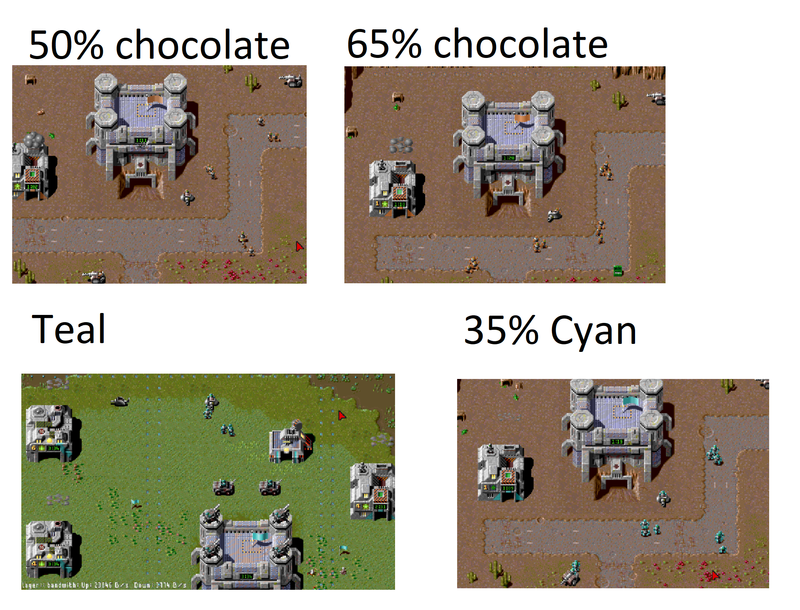 You can build factories and defensive structures. You can put robots to bunkers and towers like to APCs. There is added air-force element and naval-warfare element. The waypoints from factory and SHIFT-key waypoints are avaliable like in Zod Engine. The working guard command for units is there. Single player maps are interesting. Characteristics of major part of units are balanced. I didn't played 2014 enhanced version, there were some complains about it, but I am not in position to judge. My version was working fast and well also on low-end hardware. I'm just a regular member who has been here since the beginning. I tried to log into nighsoft server (hestia.nighsoft.net ... I guess IP 45.33.9.224) from a place where I didn't used to it before - and it doesn't work. Now I don't know if the problem is firewall of this internet provider or the nighsoft server crashed. I am curious also about the "dedicated server" option in ZOD Engine launcher. Is it intentionet only on my LAN (eg. one computer sacrified as dedicated server and 3 computers playing game as clients to it?). Or can I create in such way ZOD Engine server on internet? The other players need just to know the actual IP adress of that server in WAN? Or do I need fixed IP adress in WAN for that puropse, otherwise it will not work? There is no difference between an internet only or LAN only server. If you want your server to be reachable from outside you need to forward that specific port in your router/NAT. For example, if your server is running at IP 192.168.1.100 then you need to tell your router that port 8000 TCP should be forwarded to 192.168.1.100 port 8000 TCP. If port forwarding is enabled your server will be reachable from outside via your WAN IP. If you have a dynamic IP address (i.e. your WAN IP changes every 24h or so) then you might wanna have a dynamic DNS (dynDNS) address. These are available for free. You would then also have a DynDNS service running on your dedicated server (or router) that tells your DynDNS provider under which WAN IP address you are currentley reachable. By the way, make sure that your server always has the same network IP address! (Usually in the DHCP settings of your router/network switch). Otherwise the port will be forwarded to the wrong machine. Thank you for explanation. I know where to set in my router range of ports to one internal IP adress. My internal laptops are connected by wifi, so internal adresses are 10.0.0.1, 10.0.0.2, 10.0.0.3. Let say I will forward port 8000 to internal IP 10.0.0.1 and operate that computer as server. Then somebody from outside needs to write into Zod Engine launcher my WAN IP adress:8000? Or everybody who pings my WAN adress (without specification of port) is automatically routed to a computer coupled with port 8000?? When 3 people are simultaneously browsing internet on the three laptops (internal adresses 10.0.0.1, 10.0.0.2, 10.0.0.3), how do the outside computer see and responds to 10.0.0.2 computer and how to the 10.0.0.3?? When three distant players like to play together, but without participation of foreign people, isn't better for them to set the Zod Engine like you described and play a game in agreed time? Or use LogMeIn Hamachi or something similar to create virtual LAN via internet and play "LAN game" in agreed time? ZED Online can help to newcomers easily find avaliable human opponent, set the game and start the game. But often brand new opponent with completely unknown skills, preferences and so on. In battle against AI you know at least it's skill level and the AI "likes" whatever parameters of the match. Yes, someone from outside who wants to connect to your server needs your WAN IP and port (8000). If someone pings you from outside he is not automatically connected to port 8000. A ping is just a normal data packet. I'm not sure which port the ping protocol uses. Usually your router would answer a ping and not forward it to your internal network. How it works: The router does something called NAT (Network address translation). That's the explanation in a nutshell. I skipped some parts and the precise details how it works are also unknown to me. Yes, that's the biggest problem. I think everything that requires setting up Hamachi or exchanging IP addresses is to complicated for the average person. Also ZED Online won't solve the problem in the foreseeable future. New people will connect, see that no one is online and disconnect again. I will try to mitigate that by having a chat, so newcomers can at least see when people last played/chatted. I would also suggest that we start something like a discord server or something similar and have a regular time for people to play. Maybe something like every Saturday/Sunday at a specific time.